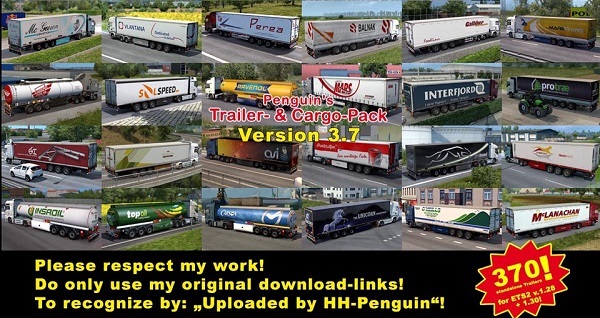 This is my trailer- and cargopack for ETS2 Version 1.33. It contains ficticious as well as real companies. Freight correspond to the trailers. Trailers also are integrated in ai-traffic. Cable connections are NOT interated. go to Settings - Gameplay - Trailer Cbles and set 'None'. If you prefer English cargo names, you also install 'cargopack_penguin_51_eng.scs'. This must be placed ABOVE of the pack in Modmanager! place it ABOVE of other mods that contain an 'economy.data'! 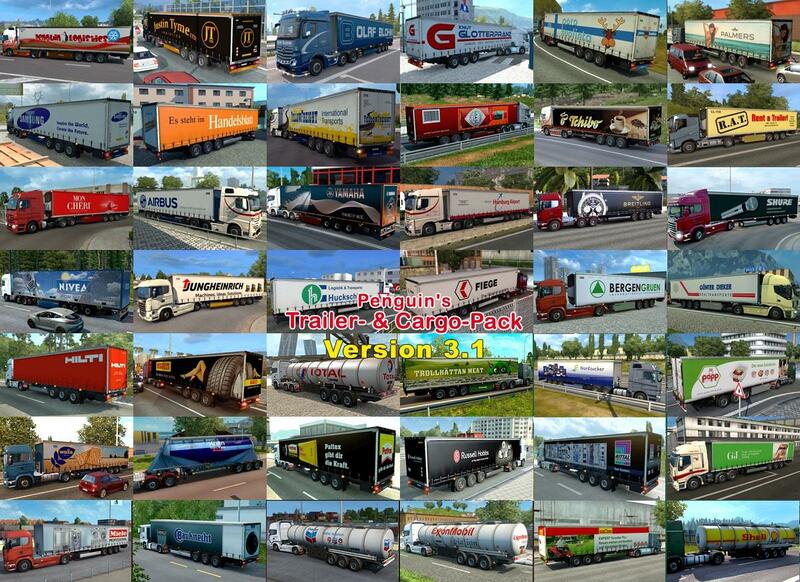 The pack now consists of 502 trailers of 493 companies! It is prohibited to re-uploaded this mod to any sites! Use my original download-links on sharemods.com instead! Due to often divergent file-sizes, most-likely, these mod-files may be changed. So, I can't guarantee for functionality and virus-free archives! In particular. I won't provide support for those! Please verify on sharemods.com, if the file was uploaded by 'HH-Penguin'! and 'scssoft.com'. Though, you MUST use MY ORIGINAL DOWNLOAD-LINKS! Cases of abuse, please report to hh-penguin@web.de! und Fuel-Cistern, Fruehauf IceLiner from Niksari Elitesquad Modz and Fuel-Tank by Fred_be. the technical part of the pack's new cargo system! Edited with Adobe Photoshop, Adobe Illustrator and Mods-Studio.